Depending on the complexity of the part to be produced there are several different techniques that Kelseal Rubber Mouldings can employ to produce parts. By far, the most common of these is compression moulding. Kelseal Rubber Mouldings produces seals, bushings, bellows, boots, diaphragms gaskets, washers, rubber to metal bonded parts, fluid power seals, rubber valves, glands, protective caps, and many other custom moulded rubber configurations. 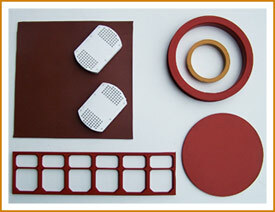 Depending on the complexity of the part to be produced there are several different techniques that Kelseal Rubber Mouldings can employ to produce parts. By far, the most common of these are compression or transfer moulding. Compression moulding is a manufacturing technique during which material is formed into shape via heavy compression force and elevated temperature. It is a highly efficient and cost effective technique. 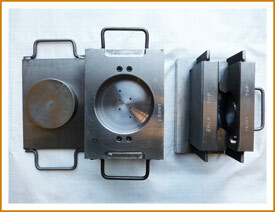 Transfer moulding is a step up from compression moulding. In this technique, material is stored in a reservoir called a pot and is injected through a sprue into the mould cavity. 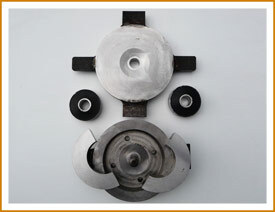 Since the cavity the material being transferred into is considered a closed cavity, flash is of less concern and higher precision parts are produced. However, since this does feature an “injection” portion, transfer moulding generates more waste, and sometimes has a higher mould cost than compression moulding. Transfer moulding is typically the technique Kelseal Rubber Mouldings uses when we produce rubber to metal bonded metal parts. Each of the above techinques offers its own advantages and disadvantages. Learn more about the moulding techniques available at Kelseal Rubber Mouldings by contacting us.